Irisheyes J Edgar, JE,CGC Hi! I'm Hoover, a Welsh terrier, welcome to my digs. Feel free to look around, just remember there are a lot of holes around here so, watch your step. As you know digging is what welsh terriers do best, that's how terriers got their name. Terrier comes from the Latin word 'terra' meaning earth. My registered name is Irisheyes J Edgar, JE, CGC, but everyone calls me Hoover. I bet you are wondering what the initials after my name mean. 'JE' stands for Junior Earthdog, and it is a title the American Kennel Club awards. You can read more about my earthdog adventures and see some pictures on my earthdog page. CGC stands for American Kennel Club's AKC Canine Good Citizen certificate . It means just what it says, I'm a good canine citizen. It is a pass or fail test made up of 10 parts. And you don't have to be a purebred dog to be able to take the CGC test. Check out the new Welsh Terrier FAQ page and the new Clicker training page! One of my favorite things to do is ratting, otherwise known as "Kill the Rat! Kill the Rat! ..." game. Ratting is another thing welsh terriers are good at. I have even met a couple rats up close. What fun! Oh don't worry the rats were fine. They were in a cage so I couldn't get to them. Mom calls it an earthdog trial. Pop down the earthdog hole to see my adventures into earthdog trials. Spring is almost here, and with spring comes new Earthdog trials. Look for new earthdog pages in May. Maybe I'll get my Senior Earthdog title at this next trial. That would sure make Mom happy. Another fun thing to do is obedience. This page show the story of my first obedience trial on February '00. It even has pictures. I had a lot of fun. Mom was really proud of me. Everyone loved me, they all laughed at my performance and told mom that I was really cute. I also saw a bunch of other terriers doing obedience too, it is not all border collies and golden retrievers. Pop down the hole to see pictures of me at my first trial. Also, check out my page on "Clicker Training". It gives a description of clicker training and has	some great links to other clicker sites. 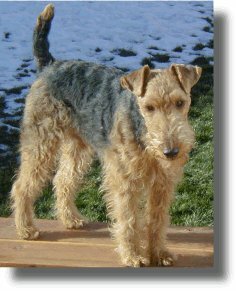 Welsh terriers are one of the broken haired terrier breeds. What that means is our hair looks and feels like fine wire. The harder the coat the better, although most of us have softer coats than that. But it takes special grooming if you want to keep your coat hard. There are two ways of grooming the broken haired terrier. You can clip the coat or what is called stripping. Mom prefers stripping for various reasons that she'll tell you all about on grooming page. Clipping softens the coat and usually fades the colors but it is simple and easy compared to the art of stripping. If you want to know more just pop down the grooming hole and see what is there. Welsh terriers and terriers of all kinds are different from other breeds of dogs. Feisty is word used to describe us all the time. Mom says that's one of the reasons she got me. We have attitude, and when you ask us to do something we ask 'Why?' We are big dogs in little packages. Mom set up a Frequently Asked Questions (FAQ) page. Pop down the FAQ hole to find what a welsh terrier is all about. I live with my humans in Colorado. It is a beautiful state, lots of bunnies and squirrels. I have a great big yard to play in. I have little brother, who isn't so little now. His name is Tad, and he is a Great Dane. I even have some picture of Tad on my picture page. o pop down the picture hole and take a look. This is a page in memory of Mom's previous dogs. I unfortunately never met them but Mom says they were wonderful. But not as wonderful as me. She sometime gets sad when she thinks about them and then I have to cheer her up. But they will always live in her heart. Time may dull the pain, but the emptiness they leave behind never goes away. But the more you love, the bigger your heart becomes so there is always room for one more. If you want to send me a note just email me or my mom, Anne, at welshiepup@dogantics.com or click on my e-mail graphic. Let me know if you find any errors or have problems accessing them. If you have ideas for new pages you would like to see. Let me know. Changes in the text are brown, like this, so the changes can be quickly seen. Hope you enjoy my web pages. site owned by Anne Macmillan. List All Sites | Join! !